My name is Kaitlyn McNulty. I’m from Long Island and am a sophomore here at SUNY Geneseo studying English Education. Along with literature and writing, I’m also very interested in history. For my research project and the independent part of our group project, I mainly focused on the living conditions of Irish immigrants and the draft riots of 1863. The common denominator between all of our individual research that tied our projects together was the topic of immigration and the struggles and hardships the Irish faced that came with leaving their home country. My name is Anna Briganti. I am a freshman here at Geneseo and am currently an english major. I am from Lewiston, NY which is about 15 minutes from Niagara Falls, NY. The biggest thing that I had researched in regards to my research project was the Irish famine and the specific Kindred Spirits memorial that was built in memory of the famine. That topic interested me in the way that the sculptor represents the donation of the Choctaw tribe. The main topic that our group had focused on was the immigration process and everything that led up to the cause of immigration. Jeanmarie Ryan is a senior history major from the Syracuse area. She researched Irish experiences on coffin ships, focusing on the long term effects of these experiences on emigrants, and the way these experiences were memorialized. This research tied back to our project as a whole, as we focused on the disconnect between the aspects of Irish immigration that are memorialized and the aspects that are ignored. Hi, welcome to the about us page! We are 4 undergraduates at SUNY Geneseo currently taking an Irish Studies course on landscape and memory. Allow us to tell you a bit more about ourselves. Rebecca Hagan is a senior History major. She did her research on the St. Patrick’s Day Parade and how who is and is not allowed to march in the parade is setting a boundary of who can and cannot be Irish-American. Specifically, she looked at the fight for LGBT Irish groups to be allowed to march in New York St. Patrick’s Day parades. Hannah Laneuville is a freshman English major. She chose to research Irish-American gang life after stumbling across a series on Netflix titled The Irish Mob. This documentary piqued her interest by telling the story of the Irish Mafia, how it arose, changed, and disbanded. Their way of life was interesting to her so she decided to further research the topic and form her own opinions on their history. Hemingway Lovullo is a freshman English major. She became interested in Irish gang life after watching Martin Scorsese’s Gangs of New York movie–specifically, how these gangs were formed, and how they interacted with one another. Sam Silver is a senior Political Science major. In enjoying learning about many aspects of different mobs – specifically, those of Irish and Italian descent – he chose to further look into how Patriarchy affects these gangs under the identity of Irish-American immigrants. We found that a common thread throughout all of our research was the formation of Irish-American identity and that is why we chose to make this site based around that subject matter. Click here if you are unsure about how to navigate this site and want some ideas. Fagan, Terry. Dublin Tenements: Memories of Life in Dublin’s Notorious Tenements. Dublin, IE: North Inner City Publishing, 2013. Kearns, Kevin Corrigan. Dublin Tenement Life: An Oral History. New York, NY: Penguin Books, 2000. Carlett, Christian. Darkest Dublin: The Story of the Church Street Disaster and a Pictorial Account of the Slums of Dublin in 1913. Dublin, IE: Royal Society of Antiquaries of Ireland, 2008. Cullen, Frank. “The Provision of Working-And-Lower-Middle-Class Housing in the Late Nineteenth-Century Urban Ireland.” Proceedings of the Royal Irish Academy: Archaeology, Culture, History, Literature 111C (2011): 217-51. Devine, Francis, ed. A Capital in Conflict: Dublin City and the 1913 Lockout. Dublin, IE: Dublin City Council, 2013. Moody, Janet. The Tenement Dwellers of Church Street, Dublin, 1911. Dublin, IE: Four Courts Press, 2017. Prunty, Jacinta. Dublin Slums, 1800-1925: A Study in Urban Geography. Dublin, IE: Irish Academic Press, 2000. Brown, Terrance. Introduction. Dubliners, by James Joyce, the Penguin Group, 1992, pp. vii-xlviii. “Crime in the slums: Appalling housing conditions at the root of many problems.” Raidió Teilifís Éireann. 17 May 1913. Dawson, Charles. “The Dublin Housing Question,–Sanitary and Unsanitary.” Raidió Teilifís Éireann. 1913. Luddy, Maria. “‘Abandoned Women and Bad Characters’: prostitution in nineteenth-century Ireland.” Women’s History Review, vol. 6, no. 4, 1997, pp. 485-503. Kearns, Kevin C. Dublin Tenement Life: An Oral History. The Penguin Group, 2000, pp. 184-220. Republic of Ireland. The National Archives of Ireland. Ireland in the early 20th century: Poverty and Health. Dublin: Republic of Ireland. Web. 9 Nov 2018. “The Tenements.” History Ireland: Ireland’s History Magazine. Sept/Oct 2011: Volume 19. Web. 9 Nov 2018. Skinnider, Margaret. 2016. Doing My Bit For Ireland (Illustrated Edition). S.l. : Echo Library. McGarry, Fearghal. 2017. The Rising: Ireland: Easter 1916. Oxford: Oxford University Press. Wills, Clair. Dublin 1916 – the Siege of the Gpo. London: Profile Books, 2010. Yeats, William Butler. “Cathleen ni Houlihan.” Plays in Prose and Verse, Macmillan Publishers, 1922, pp. 3-18. Hamilton, Norway. The Sinn Fein Rebellion as I was it. “1916 Easter Rising | 1916 Rebellion Ireland | GPO Dublin.” Patrick Pearse | Leaders of the 1916 Rising –, www.gpowitnesshistory.ie/1916-easter-rising/. Wills, Clair. Dublin 1916: The Siege of the GPO. London, Profile Books, 2009. Pearse, Patrick. “Patrick Pearse’s Graveside Panegyric for O’Donovan Rossa on 1 August 1915 at Glasnevin Cemetery in Dublin.” Easter Rising 1916 Ireland. Accessed December 13, 2018. http://www.easter1916.net/oration.htm. Pearse, Patrick. “POBLACHT NA H-EIREANN THE PROVISIONAL GOVERNMENT OF THE IRISH REPUBLIC TO THE PEOPLE OF IRELAND.” Easter Rising 1916 Ireland. Accessed December 13, 2018. http://www.easter1916.net/proclamation.htm. Connolly, James. “The Slums and the Trenches.” Modern History of the Arab Countries by Vladimir Borisovich Lutsky 1969. Accessed December 13, 2018. https://www.marxists.org/archive/connolly/1916/02/slums.htm. CONNOLY, JAMES. LABOUR IN IRISH HISTORY. S.l. : CITIZEN PRESS, 2016. Foy, Michael, and Brian Barton. The Easter Rising. Stroud: History Press, 2011. The Troubles, although technically came to end with the Good Friday agreement, still haunt Northern Ireland today. There are physical barriers as well as mental as the people caught up on the conflict figure out how to deal with the past pain. 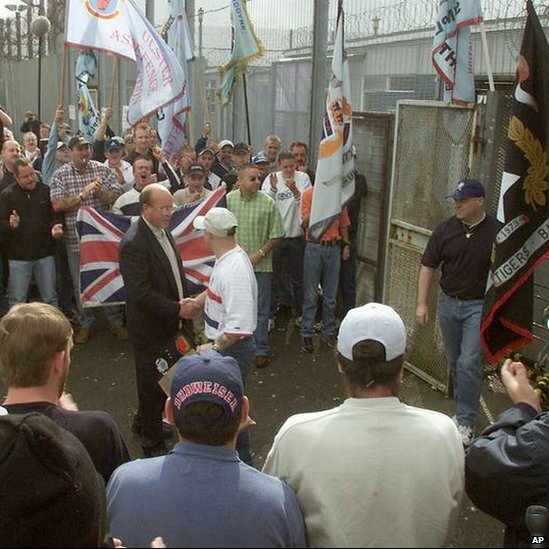 The Good Friday Agreement released all people arrested for involvement with the Troubles. Today, they don’t know how to interact in their daily lives due to so many years behind bars. Finding jobs has also proved difficult, since many businesses do no hire anyone involved with the conflict. Suicide rates in Northern Ireland are the highest in the United Kingdom and double the rates of those in London. This is due to the violence that many people witnessed and were involved with during the Troubles and lack of resources and help to deal with the issues. The people of Northern Ireland have to face many challenges as a result of the Troubles. Although the North Ireland Peace Process is largely considered a success, there are still many negative parts that have gone along with it. Unionist politics focused on separation of Catholics and Protestants, and ensuring Nationalists stayed out of government. Through gerrymandering, school segregation, and the housing crisis, Protestants made Northern Ireland a cold place for Catholics. The debasement of the Catholic population through legislation only enforced social separations that had already been present from the beginning. 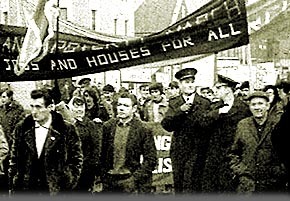 Catholics had been considered second-class citizens or worse since the English conquests, separated in all aspects of life, perhaps most prominently in the late 1800s–early 1900s with Dublin tenement life. These societal partitions created fear and anxiety of the other culture, which surfaced in Northern Ireland’s legislation at the beginning of the 1920s. Protestants and Catholics became more self-contained than before, which only increased unease, and presented itself in further regulations and in physical structures like the peace lines. Peace walls contributed to dissociations even further, because there were now physical walls between Protestant and Catholic cultures, leading to more tension. Peace wall in Northern Ireland. Around 400 AD, Saint Patrick converted the people of Ireland to Catholicism, as England at the time was Catholic. In 1170 the King of Leinster, Dermot MacMurrough, was overthrown and appealed to the current king of England, Henry the II, for help. This gave Henry II a chance to invade Ireland, and a reason: Pope Hadrian IV wanted Henry II to conquer Ireland and further spread English Christianity. In 1532, Henry VIII separated from the Catholic Church of Rome to divorce his wife, Catherine of Aragon, and England became a Protestant nation. In 1541, he was declared King of Ireland. He created laws to increase English control over Ireland, and attempted to convert the Irish to Protestantism–to no avail. The Penal Laws were put into place beginning in 1675, which prevented many Catholics from an education, property, and intermarriage. From 1845 to 1852, 2 million of Ireland’s 8 million died or emigrated due to repeated failure of the potato crop, known as the Great Famine. Those most affected were the Irish peasants. And in the late 1800s to early 1900s, many Catholics were living in squalor in Dublin tenements, with barely enough money to pay rent, let alone buy food. 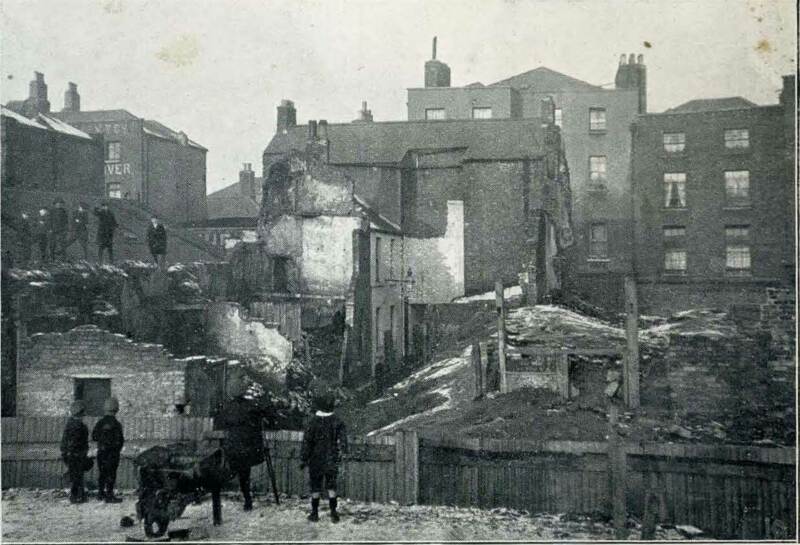 Photo of a destroyed tenement in Dublin. Since the English first involved themselves in Irish affairs, the Irish have been second-class, if that. With so much degradation, it’s a wonder the Irish didn’t do anything before the 1916 Easter Rising, and even then, few actions were taken. So why did the Troubles happen in the ’60’s? Why didn’t it happen before? Housing civil rights march January, 1969. Since the beginning, the Irish Catholics have been separated from their Protestant counterparts. They were aware of the different lives each other led, but unaware of the differences themselves because they were so separated physically and socially. There was segregation in religion, education, and even the bars they drank at, so their first real interaction was during the housing crisis. Catholics and Protestants were vying for the same homes, and when single Protestants began taking homes that could have been for large Catholic families, there was uproar, and that’s when the first civil rights marches began. Catholics were able to truly see for the first time the advantages and partiality given to Protestants, even though they had been thus for centuries. The inability to secure a basic human need was the final straw. Get to know our research group! Emily Meyer is a senior history major and art history minor at SUNY Geneseo. She has an academic background in European, with an interest in the British Isles, and Latin American history, with a special interest in cultural history. She plans to go on to get her Master’s in Public History, with hopes of acquiring skills in archival work, museum studies, and preservation. For her individual research project, Emily focused on Dublin’s tenement buildings, specifically those in the Church Street district, and the community and culture that emerged as a result of the extreme poverty of tenants. Cathrine McNeil is a senior history major at SUNY Geneseo. She has concentrated her studies in American and Islamic history. She is interested in Irish studies to better understand her family lineage and corresponding Irish history. Cathrine plans to go to law school after finishing her studies at Geneseo in the spring. For her class research project, Cathrine focused on women in the rising with an in depth look at Margaret Skinnider and her participation in the 1916 Easter Rising. Robby Billings is a high school graduate and current freshman at SUNY Geneseo. He is currently a history major with hopes of earning a teaching certificate. For his individual research project, Robby explored the lives and struggles of women living in urban poverty, primarily in Dublin’s notoriously inhumane tenements. Lauren Lambie is a history and adolescent education major at SUNY Geneseo. She is currently a sophomore and plans to attain her masters so that she can teach history at the high school level. For her individual research project, Lauren focused on how the landscape of Dublin at the beginning of the 20th century played into how the 1916 Rising played out and how the rebels used it to their advantage. Joey Saxton is a high school graduate and current freshman at SUNY Geneseo. He is currently undecided but has interests in psychology, he is also part of the Geneseo track and field team. For this project Joey focused on the political leaders and their views that played a role in the 1916 Rising, more particularly that of James Connolly and Patrick Pearse. Not only did women participate in the rising but also Irish children. 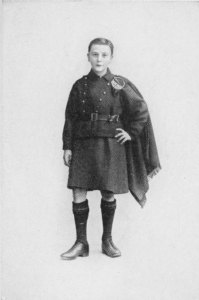 The Fianna boys consisted of boys and girls from the ages of eight to eighteen. The organization of these children was completely the opposite of the traditional family relationship. The children were sent out for training away from their homes and families. It did not matter what the children’s prior affiliation was before they joined the Fianna Boys. The Fianna accepted all creeds, classes, and parties. 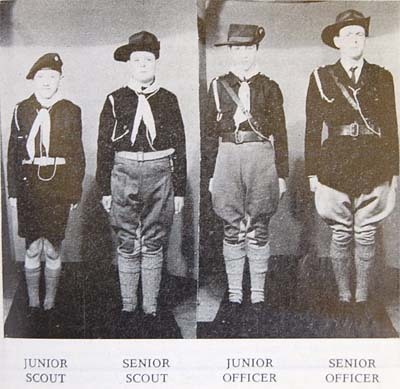 The Fianna wanted to gain independence by training youth. They were involved in both physical and mental training. The Irish language and Irish history were also discussed. Their ideology was to use heroism to overcome oppression. The children learned values of citizenship, discipline, and manliness. They strived for nationalist values and not imperial ones. The group arose around concerns of “the moral and physical degeneration” of the Irish. The Fianna Boys fell under the control of the Irish Republican Brotherhood. 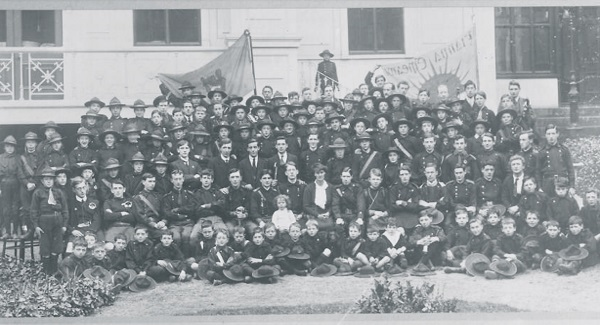 The Irish Republican Brotherhood increased the military aspect of the Fianna Boys. They trained the boys so they can fight for Ireland when they become men. Being a Fianna Boy was a “sacred duty” to Ireland. Fianna Éireann scouts with Countess Markievicz. She asked Arthur Griffith to establish a Boys Corps of Sinn Féin. 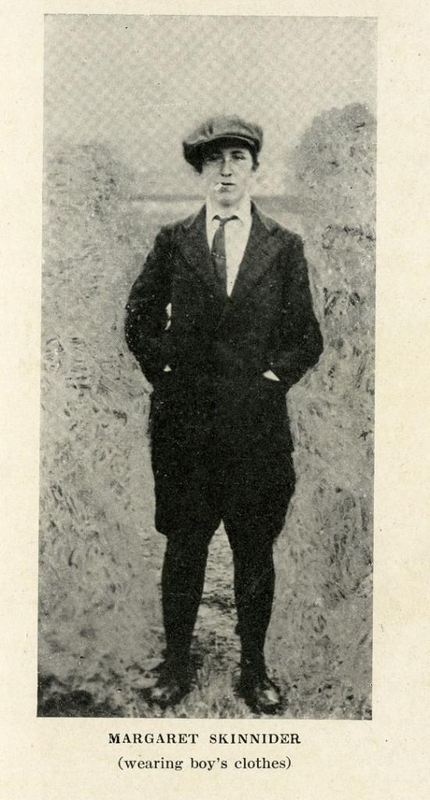 Photograph of Margaret Skinnider wearing boy’s clothes. Skinnider also describes an episode where the Fianna Boys held a house for three days. When they were asked how they learned to shoot so well they explained that the Countess taught them every Sunday. Skinnider was dressed up as a Fianna Boy and was able to experience first hand what they did. She walked with them while they asserted their authority. She explained that the Nationalists used the Fianna boys to save Irish men from fighting in the war. Men were out of work because Britain was trying to force them to join the army. The Countess would take children on outings. An example in Skinnider’s memoir was the Countess taking the children to see a play. On this occasion, British officers were present. The Fianna Boys started singing, “The Watch on the Rhine” and the officers responded back with “God Save the King.” “God Save the King” was not socially acceptable at the time and the British were pelted with vegetables and the play was shut down. This struck me as an odd example of the outings that were probably typical with the Countess. Although she is a motherly figure, the Fianna Boys would continue to push the acceptable norms of the British oppressors. Welcome to our page on the duality of Irish authenticity! We are Chloe, Alissa, Maeve, and Rebecca, four Geneseo students enrolled in a class centered on Irish landscape and memory. Our project explores how authenticity manifests among the Irish population, landscape, and global perceptions of the region. 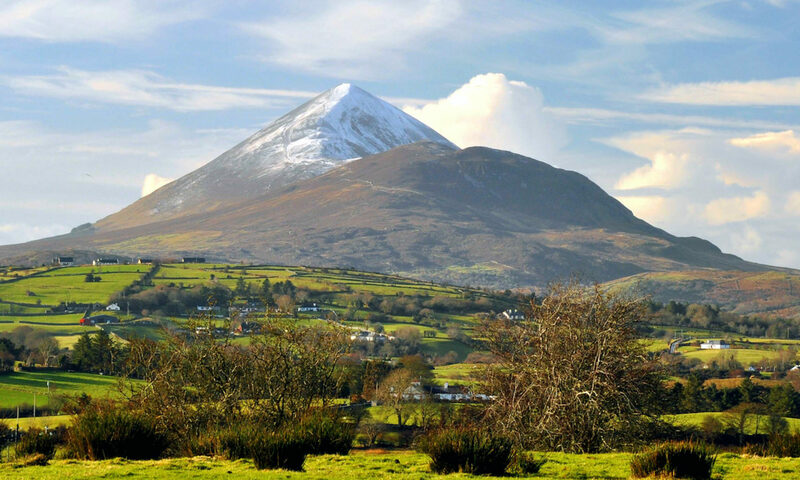 Specifically, we turn to the areas of Connemara and Killarney in Western Ireland which possess rich histories of tourism. Oftentimes these places are deemed to be “authentic” because the people are believed to be living lifestyles true to their culture as they interact with the land. However, as we will exhibit, the notion of authenticity is not as legitimate in Ireland as popular sentiment would have many believe. By examining authenticity in depth, scrutinizing the commodification of the people and landscape, analyzing advertisements, and assessing the struggle for Irish independence, our website will demonstrate how authenticity serves to benefit the Irish while simultaneously pressuring the populace to conform to a fabricated image.